What I wore to my cousin’s wedding - Do You Speak Gossip?Do You Speak Gossip? It’s finally time to show you the outfit I wore to my cousin’s wedding. I know many of my frequent readers were waiting to see it, and I hope it doesn’t disappoint you! I want to thank my mom for taking these photos (even if it’s highly unlikely she reads this). I always say how blurry are the pics she usually takes because she has trembling hands, but I think she did a fantastic job on this trip. Maybe the DSLR is much easier for her to use. Yumi dress with pleated skirt and draped front (similar style here and here), Doca clutch (similar style), Zara basic color-blocking sandals, Donna Karan sunglasses, local store gold earrings, Calvin Klein gold watch (left hand), Dyrberg/Kern gold cuff bracelet (similar style), Yves Saint Laurent Arty Oval ring in mint green (here in turquoise, blue and coral). We took these photos next to our hotel’s pool, just before we leave to “dress” the bride and prepare her for the wedding. But I’ll leave the details for my next post (which is gonna be all about the wedding preparations, and the reception). The hairstyle was once again done by my aunt’s hairdresser (who also did my aunt’s and cousin’s hairstyles). To be totally honest with you, I didn’t like this one very much! It was fine, until I put on my dress and my jewellery and then I thought that it wasn’t “me”. I think it ages me a lot, and it isn’t as “playful” as the previous one. But we wanted a formal one for the wedding, as I’m a close relative, so I just went with it. At least it helped with the heat, and the wind, by staying exactly at its place all night. What are your thoughts about my wedding outfit? I want to hear them, so don’t forget to leave your comments below. Ayto to xrwma einai to agapimeno mou! Einai toso yperoxo! Kai to exeis syndyasei teleia! Den eixa katalavei to mege8os tis tsantas! Para poly wraia! Bravo koukla! S’euxaristw poli Elsa. Nai i tsanta einai arketa megali, kati pou arxika den mou arese, alla telika me volepse poli. Καλά να περνάς στη Χαλκιδική Μ. μου!! Κι εγώ τώρα θα πάω στο Ποσείδι για 5 μέρες..
How sweet is that, that your mother took the pictures! Really sweet! I don;t think that hairstyle aged you – in fact, when I saw it I thought “wow, very beautiful” and then later I read you didn’t exactly like it… but well, sometimes i think the same about hairstyles when I try to change mine, and people say “no, I don’t think it ages you”. So you see, we tend to be very judgemental towards ourselves! 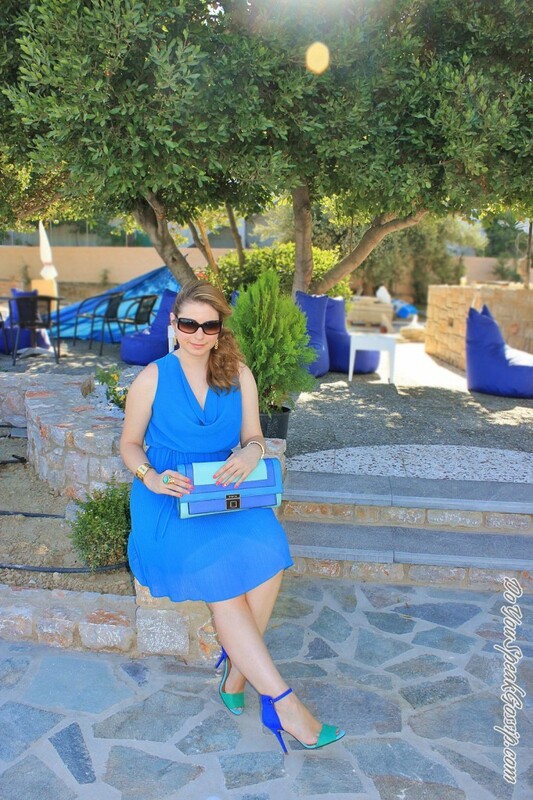 I loved the dress and the match – sandals and clutch and the background is amazing! The swimming pool and the houses, really a great place! I am nt disappointed, of course not!I really think you look very beautiful! Really love airy fabrics, and the color? Great! So now I think you are in Chalkidiki, enjoy it a lot and again, eager to see the preparations for the wedding! Thank you so much Denise! Maybe you’re right. I don’t like what I’m not used to…it doesn’t feel “me”. teleio forema!poly kalokairino! nomizw egine ap ta agapimena mu outfits panw su! Gorgeous dress – love the clutch! I think the hairstyle looks really good and you look really pretty here 😉 It’s always nice to try something different every now and then. And your mum did a great job! Thank you so much. You’re right. It’s just that I don’ t like changes so much. Oh don’t worry. I’m also on vacation and it’s really difficult to read all blogs I follow. Hey M! Been looking forward to the wedding outfit and I’m not disappointed in the least! Well done for matching the colours, always a hard job requiring many hours of shopping but you found the perfect items! I like your hair style but I also prefer the previous one however I definitely don’t think it ages you at all! The dress hangs beautifully and is a lovely colour which is totally complimented by the background you and your mom chose. I’m sooooooo jealous looking at these pics and seeing the sunshine and pool, it rains every day in the UK at the moment and the summer is slipping away. Apparently it will get better in time for the Olympics but I think it’s a conspiracy to make sure everyone turns up!! Thank you so much Laura. I’ve heard about the weather in UK this summer. Sounds terrible. I hope it will get better in August. In Greece, the weather have been really hot for the past month. I’m on vacation again, this time in Northern Greece, in Chalkidiki. That dress looks so good on you! love the heels! Pingback: Wedding details and reception | Do You Speak Gossip? Teleio xrwma teleio forema teleia mallia! To oti epaixes me tis apoxrwseis tou mple exei dwsei poly style sto outfit! S’euxaristw para poli! Xairomai pou sou arese to outfit pou dialexa gia to gamo! Siggnwmi poy argisa toso na apantisw alla molis girisa apo tis diakopes mou! Telio disimo eidika gia gamo! Sou paei trela auto to xrwma! Koukla! S’euxaristw poli gia ta poli glika sou logia! 🙂 Xairomai pou sou arese! The blues are really pretty, especially with the pool behind you. Your mom did a great job with the pictures! Love the heels and my daughter loves the dress. You look great! Pingback: Game of Colors | Outfit post | Do You Speak Gossip? Pingback: Top 12 posts of 2012 | Do You Speak Gossip? Pingback: Designer dresses from MissesDressy.com | Do You Speak Gossip? Pingback: Wedding season | Outfits | Do You Speak Gossip? Pingback: Mint jeans, statement necklaces and full moon | Do You Speak Gossip?